A friend of mine was helping with an auction at the Lakewood Cooperative Preschool where the were doing a cakewalk and she asked if I would donate a cake. I love making cakes, so of course I volunteered. Lately, I have been slacking on the recipe sharing for the blog so I figured it would be a perfect time to create a new cake. I wasn’t sure what type of cake to make, but knew that our friends on Facebook would have some good ideas. Many people mentioned carrot cake, which I have already made. Then Irene mentioned carrot cake with pineapple and that led to this idea. Thanks for the help Irene! For this recipe I made a frosting I could decorate with. I prefer the taste of the frosting I made with either my original carrot cake or pineapple cake, but they are too soft if you are looking to decorate with. Grease three 9″ cake pans, cover with parchment paper, grease parchment paper and sprinkle 1 tablespoon of brown sugar over each pan. 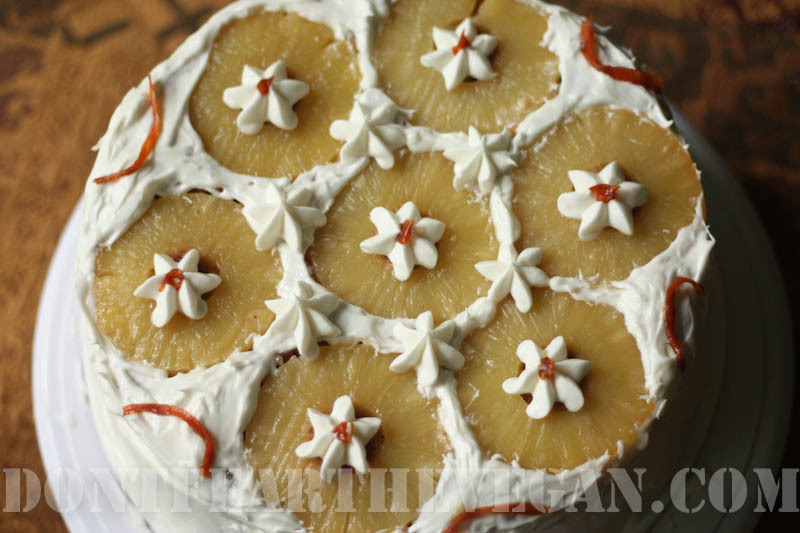 Arrange pineapple (6 around the outside, one in the center) over sugar. I ended up with one pan having one less pineapple ring. Set pans aside. In a large mixing bowl, blend ingredients flour to Ener-g. In a separate bowl mix the ingredients from 2 cups sugar to carrots. Pour wet ingredients into dry ingredients. Mix well. Once blended, pour equally in the three pans, covering the pineapple. Gently tap the bottom of each pan to get the air bubbles to the top. Place in oven on middle rack, making sure pans do not touch. Bake for 20 – 25 minutes. When a toothpick comes out clean they are done. Put pans on cooling rack. Remove from pan once they are cool enough to touch by hand. Once they are completely cooled they may be frosted. Cream shortening, cream cheese, and pineapple juice. Add powdered sugar slowly, and mix on medium speed until all ingredients are blended. Mix a few more minutes, until creamy. Place first layer on cake dish, pineapple side up. Spread a generous amount of frosting to cover layer staying 1/4″ away from the edge. Repeat on second layer. Place third layer on top and decorate as you wish. If interested I made the flowers in picture with a 2D tip. The centers and carrot decorations were candied. Directions below. Use a potato peeler or pairing knife to make thin strips of carrot. Heat oil, syrup and spice over medium heat in a small pan. Once coconut oil is melted saute carrot strips until they are soft enough to work with, about five minutes. This is the prettiest looking cake I have seen in a long time. Must make for next potluck (I’m always happy to have something that non-vegans can’t believe is vegan). Thanks:) This cake will definitely make any crowd happy! My grocery store has had lots of fresh pineapple lately. Do you think fresh would work as well as canned? I wasn’t sure so I did some research. It can be done and everyone that has used fresh pineapple says it taste great but taste completely different, in a good way. If you try it, I would love to hear about the results.